Enables storage-integrated data lifecycle management possibilities. Provides a software-defined storage service for multi-institutional domains. Built from inexpensive, commercial off-the-shelf (COTS) components. Robust, reliable infrastructure constructed to minimize single points of failure. High performance by integrating high-bandwidth network links, a large number of disk spindles, large server memory and SSDs. Built using open source software components allowing the project to customize specific components to provide required OSiRIS functionality. Incorporates detailed monitoring of the infrastructure/network topology. Enables cloud infrastructures, e.g., OpenStack. 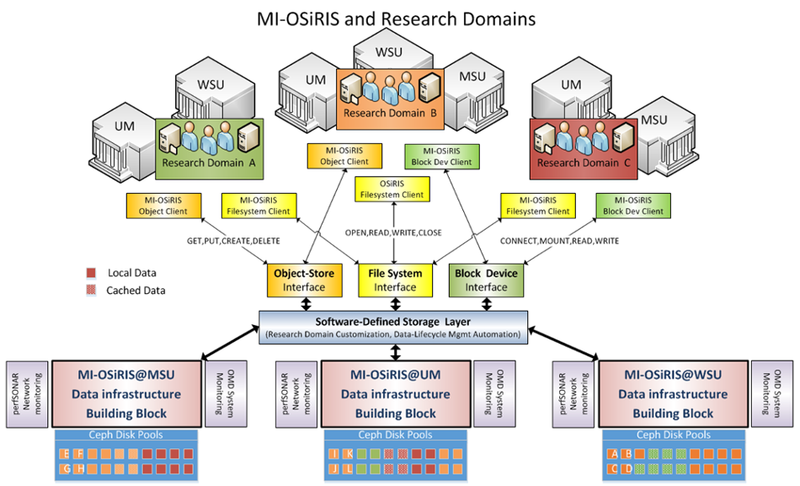 Collaborative storage for researchers/resources outside of our campuses. Connected to the Internet at 10 to 100 Gbps. Uses Globus Connect GridFTP-based Data Transfer Nodes (each at 4x10Gbps) for wide-area data transfer. Users get customized, optimized data interfaces for their multi-institutional data needs. Network topology and PERFSONAR-based monitoring components ensure the distributed system can optimize its use of the network for performance and resiliency. OSiRIS, via CEPH, provides seamless rebalancing and expansion of the storage. Allows universities to reduce cost via economies-of–scale while better meeting the research needs of their campus. Eliminates isolated science data silos on campus. Data sharing, archiving, security and life-cycle management are feasible to implement and maintain with a single distributed service. Data infrastructure view for each research domain can be optimized. The OSiRIS project is based upon a specific set of hardware choices designed to deliver the capability and performance we anticipate requiring to meet the project goals. We are emphasizing the use of COTS (Common Off The Shelf) equipment specially configured, tuned, and deployed to meet the project goals and leverage the capabilities of CEPH.